How to use flight radiation calculator? But what does the 1 mSv dose mean? What is the radiation and exposure risk? This flight radiation calculator will help you to estimate the cosmic-radiation exposure you get during your airplane flight. If you are wondering how much radiation your 14-hour trip from New York to Tokyo produces, and how much is that in comparison to simple chest X-ray scan, use this airplane radiation tool. If you want to know what are the other sources than radiation from flying, and what is the risk posed by airport security scans, keep reading! You may want to check our flight emission calculator and become a responsible, environmentally aware traveler. The average value for a 1-hour flight is ~0.003 mSv = 3 μSv. The body screening dose is 0.015 μSv to 0.88 μSv range, according to the article Radiation exposure and privacy concerns surrounding full-body scanners in airports, but usually it is at the lower end of that range, around 0.02 μSv. Studies have found that this radiation level is safe, even for pregnant women and children. After couple minutes of the flight, you got more radiation than from the security check! Now we know that radiation from flying is the main component. Why is it so? Where does that radiation come from? It's directly tied to the altitudes at which the planes are flying - 30,000-35,000 feet. The air gets thinner with every foot, and it contains less and less of gas molecules. It means that aircraft can travel faster while burning less fuel, but also it implies that we have fewer particles to deflect incoming cosmic radiation. The farther we go from the Earth's surface and closer to the source of the radiation, the less shielding we get. Experts say that for the vast majority of people, airplane radiation is too small to create any health risks, so don't worry too much. Enter the number of hours of your flight. You need to remember that it's only the average value, and some aircraft routes are posing the higher risk, e.g., flying polar routes near the geomagnetic poles. Let's say it's a 7-hour flight from New York to London. The radiation dose will appear below. It's the product of average dose rate (0.003) and hours of your flight, in our example it's equal to 0.021 mSv - 0.34 % of the average annual radiation dose per US citizen. If you want, you can change the radiation rate in the advanced options. Also, you can compare how much is that in comparison to standard medical procedures, such as Xray scans and CT scans. 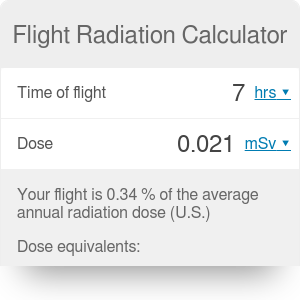 Remember that our flight radiation calculator is a flexible tool - you can type the dose, and you will get the information how many flight hours does it take to reach the chosen exposure level. Well, 1 mSv is a lot. The average annual radiation dose per person in the U.S. is 6.2 millisieverts. Additional overall cancer risk is estimated to rise by around 0.005% per 1 mSv. The sievert is a unit to measure the health effects of low levels of ionizing radiation on the human body. 4,000,000-5,000,000 μSv = 4-5 Sv: dose required to kill a human with a 50% risk within 30 days, dose received over a very short duration. So, to calculate quickly - eating three bananas will expose you to similar radiation as security screening. Human activities are also causing the radiation, to mention only the nuclear weapon tests or accidents in nuclear power plants, but it's still the small fraction of background radiation. Flight Radiation Calculator can be embedded on your website to enrich the content you wrote and make it easier for your visitors to understand your message.